Indonesia is not unknown to many surfers around the world to have many perfect surf spots around its many beautiful islands surrounded by many choices of waves. Be it that you are an advance surfer or a beginner, you will be sure to find a place to surf here. Many surf travelers will come to Indonesia for its perfect surf breaks, white sand beaches, warm and sunny weather and local friendly people. This is almost a perfect setting to make Indonesia an ultimate surfer's paradise. The swells comes from the south and southwest of Indonesia, so all the coastlines facing in these directions will get a good amount of waves to surf. This includes places like Bali, Lombok, Java, Sumatra, Flores, Sumbawa, Sumba and Timor, just to name a few of the thousands of islands in Indonesia. 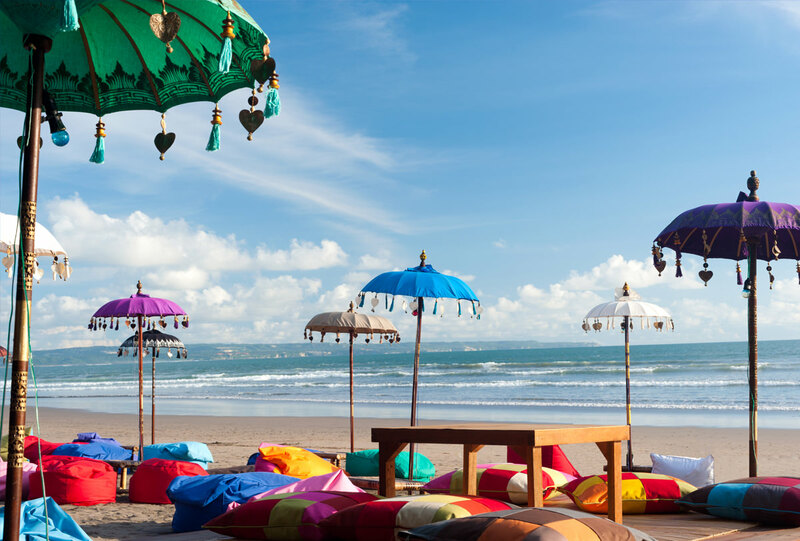 With as many as 100 surf spots in Bali, it can be best known for surfing in Indonesia, not just because it is a main tourist place in indonesia. Bali is famous for surf at places like Padang and Uluwatu which is famous for its entry cave. The full force of wind comes from southern ocean swell therefore its southwest or southeast coasts are dotted with many surf spots. Come during the dry season from June to September for perfect surf conditions though this is also the peak season so be prepared for the crowd. Next to Bali, is the less crowded Lombok but no less in beauty. This may be your answer to perfect surf without fighting for space. One of the famous secret yet not so secret anymore surf place is The Desert Point. There are good surf breaks here in surf spots like Mawi, Mawun and Point X along the southern coast of Lombok. The best season to come here to surf is from April to october and the swell comes from southern wind as well. Two of the three famous Gili Islands in Lombok deserve top places on their own for having own unique surf breaks. Though the frequency is not as good as the other spots in Lombok, this place promises good surf for the experienced surfers if they manage to catch the breaks. Many of the locals come here to enjoy the surf in secret and when in good timing it will swell more than you expect but do be careful as it can be unexpected. Another epic surf place that many people love, where it is touted to be adventurous with minimal crowd. It has different sections along 2km long point, from hollow walls to shallow and dangerous reef. G-land also has world-class barrels on lower tides and bigger days but be careful of sharp reefs at the break, therefore booties are a must. It is also known of its consistent offshore trade winds. At the West of Sumatra, the Mentawai Islands has the most consistent surf breaks in Indonesia making it one of the preferred choice for serious surfers. Surfing spots here includes like E'bay, Beng-beng, Nipussi and Pitstop. Best time to come here is during the dry season of May to October. Here you can get many islets and flawless reef with sun blue waters, and also offshore winds and spitting tubes. Remote location that takes you into the deep water trenches which funnel in the southwest Indian ocean swell. Here choose Asu or Bawa for its reputation for consistent overhead surf. You get surfing on outer-islands reefs and crystal clear water. Come here in between May to October during dry season for the best surfs.